Currently about 50% of people age 18-21 are in college. I got data from the CPS for School Enrollment of the population as of Oct. 2011. The data covers both undergrad and graduate. 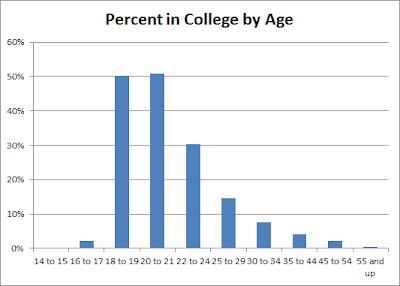 You can't see it in the chart but surprisingly 0.2% of the 14-15 year olds are in college. I suspect theres more genius kids out there than I realized or its just kids enrolled in a joint community college deal through their high school. 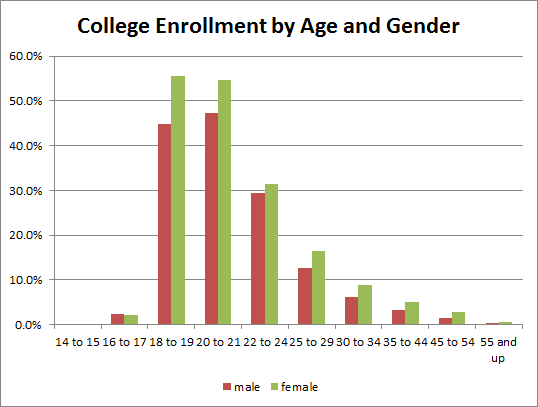 About 45% of 18-21 year old men are in college and around 55% of women.